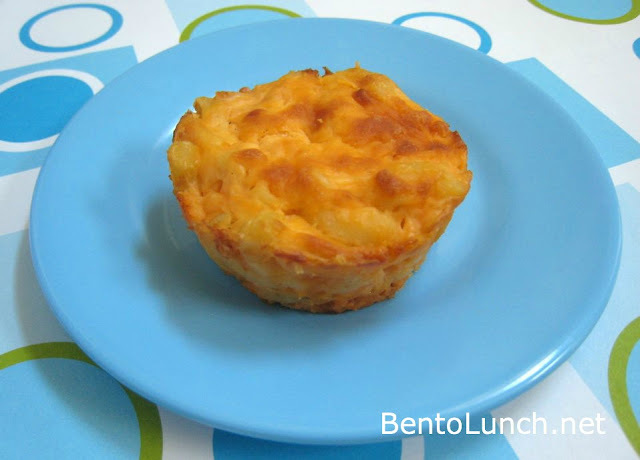 In keeping with the back to school themes I'm seeing everywhere, our The Kids Cook Monday post shares a fun new recipe that would go great in a lunchbox--macaroni & cheese muffins! My mom actually sent me the recipe, but it looked perfect for my kids with a few tweaks (since we happen to be big fans of the extra cheesy kinds of macaroni and cheese). One thing I will do differently next time though is using paper muffin cups. I had a couple stick to the pan, but that's my own fault for buying the cheap no-name bake spray. -Place a cracker in the bottom of each muffin cup and set aside. -Cook macaroni according to package directions; drain and return to pot. -Stir in remaining ingredients till well-blended. Spoon mixture into muffin cups and sprinkle with extra cheese. -Bake 15 to 18 minutes, or until heated through. Let stand for 5 minutes, remove from tin with knife if you don't use the muffin papers. Yum, these look really good and super bento friendly. Thanks for posting the recipe! Great idea. I make baked macaroni all the time and this is a perfect way to transport to school! Cheddar cheese soup? Now that is something I never heard about! Must be something American. Too bad, because it means I can't try them and they sound so good! My kids would love that. Thanks for sharing. What a great idea! I am always looking for some good peanut free recipes for my son's lunches! I made these and just posted them on my site - stop by and see. Also I linked back to you - thanks for the inspiration! Making these now with my new Kindergartener. She loves measuring and stirring and cooking with mom... this was a perfect recipe for us to make together. :) Have you tried freezing the leftovers? I wonder how well they do when defrosted... Thank you!